Agassiz’s Speedway is a simple oval, two corners and two straights, but it is small and tight… and notorious for taking out cars. Most often, inexperienced drivers panic and hit the brakes, understeering into the wall. But even pros, who have been drifting the track since 2007 when Cell Block D started have had their share of mishaps here. There was a thin patch of snow still lining the outside of the track, where shadows had preserved it from the sun. As the day went on and the snow melted, the track became half wet and half dry, creating many close calls and bringing end to a few cars’ day. Luck was on my side this week, a rescheduling of the event, Cell Block D, made it the day after the Drift Union Vancouver premier. Since I was going to be in the area anyway I made the decision I was going to visit the event to shoot some photos and get some warm-up with the camera for the up-coming season. I had never been to a Cell Block event so it was sure to be interesting. 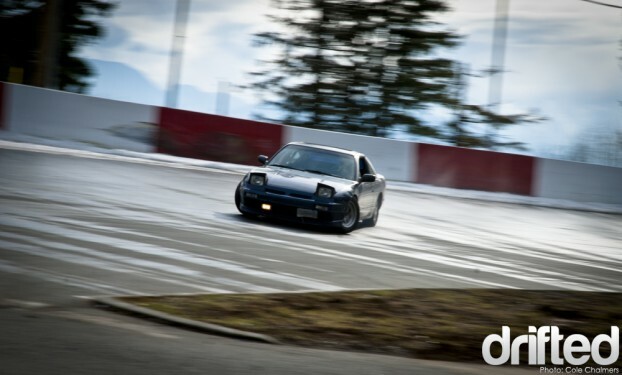 Then few other things came up and I ended up having to drive my recently aquired s13 winter beater to Vancouver. After some convincing and some last second scrounging of tires, tune ups, and a sketchy paint job, it was decided, not only was I going to shoot the event… but I was also going to drive in it as well. Cell Block D is an amature event series put on by Trent Stromkins of Drift Safari. 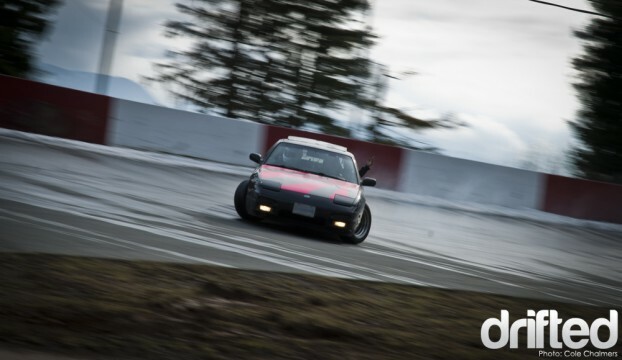 It’s held in Agassiz, British Columbia and, for the past year and a half, CBD has been on a hiatus due to the busy schedule of Drift Safari competing in Formula D and other events. The original date for the event had to be postponed due to snow on the track, apparently the groundhog was a little confused this year, but a week later the track had mostly cleared and Cell Block was back in action! Sharing my car with me for the day was, my bro’s from Drift Union, Shawn and Logan. I trusted them more with the car than myself, having only one track day under my belt, in comparison to their 3+years going sideways. 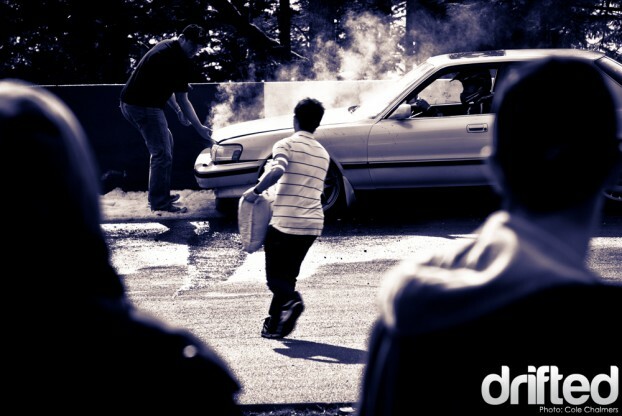 Knowing Agassiz’s history with ending cars, and my inexperience, the tail lights and hatch were pulled off the car. We figured, at least if we went back first into the wall, it might still be salvageable to drive home. 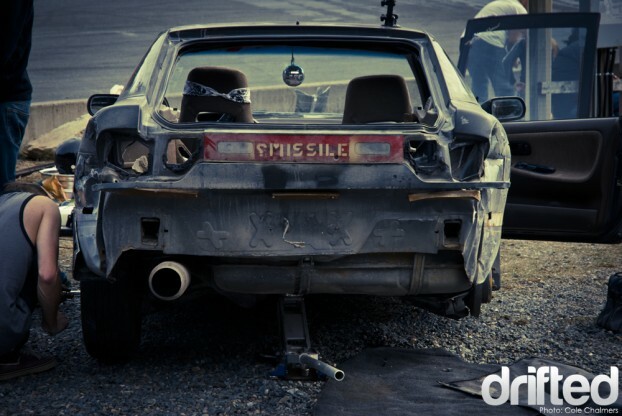 But as you can see from the “Missile” stencils on the car, we were fully prepared to ditch it to the nearest auto wrecker if need be. 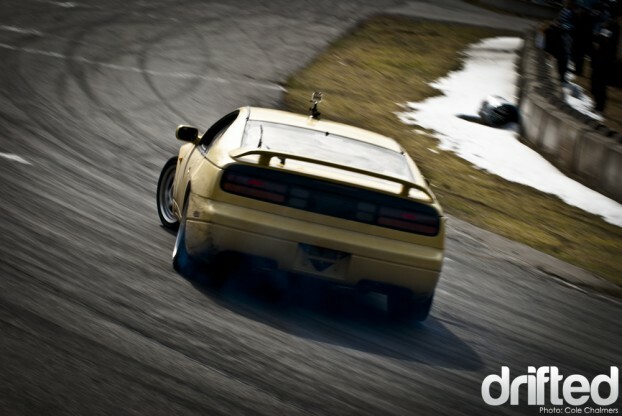 You don’t see Fairlady’s sliding too often, but this guy was managing fairly well throughout the day. 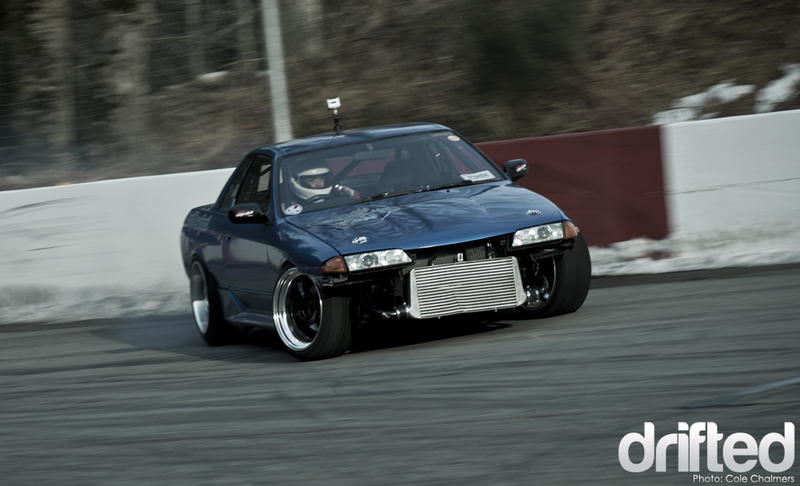 Cody Ross is from my hometown of Kamloops, he absolutely slays it in his KA powered S13. 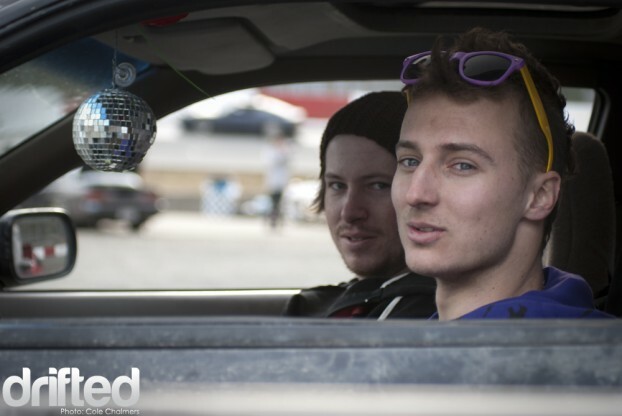 He is upgrading to an SR20 soon, so I hear. That should spice things up a little for him! It turned out that pulling the hatch and the tail lights from my car was a good call, Shawn got a little to excited with his wall taps and did work the rear end. I drove it home like that. My car wasn’t the only one to show the wall some love. 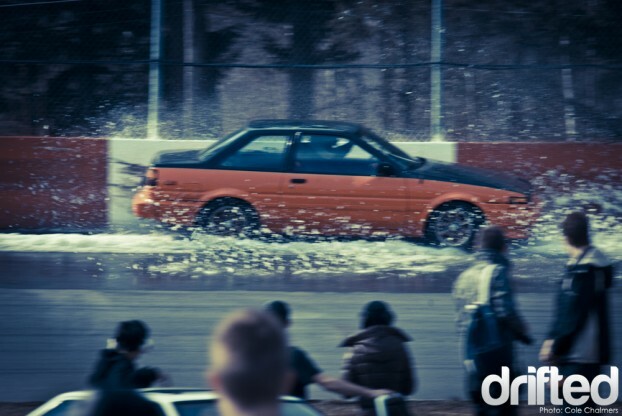 Trevor Pudar’s Corolla took a hard slam after slipping up on the half wet track. I believe he was able to get it home, but there was some solid damage. Another driver, in an X8 Cressida, finished his day early as well, for the same reason. The half wet, half dry conditions were a car killer for sure. I heard one or two more cars kissed the walls after we left too! Trent found some time in between sending out run-groups to do a few laps in his sr20 powered Corolla. It wouldn’t be fair to put on an event and not get to drive it! 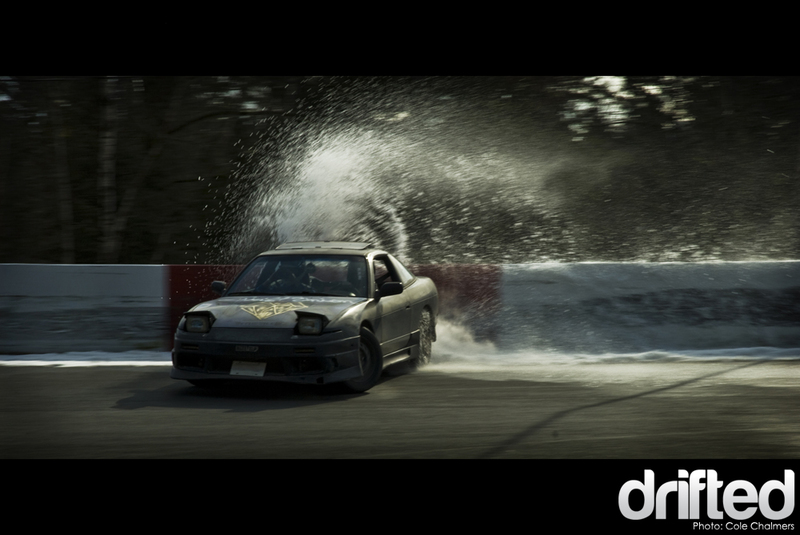 This weekend of early season drifting is just what the doctor ordered. I’m so pumped for 2011. Photo Album from the event can be seen HERE.